Bob Gandley has been representing businesses, municipalities, municipal authorities and individuals in a variety of environmental matters for over a decade. He concentrates his practice in the areas of regulatory compliance and permitting. Bob reviews and comments on proposed federal and state environmental regulations to minimize the impact on clients' operations. 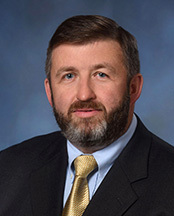 He assists clients in submitting and negotiating air quality permits (including Plan Approvals for construction or modification of sources as well as Title V Operating Permits and State Only Operating Permits), the submission of Deviation Reports and Compliance Certification Reports, as well as the negotiation of Civil Penalty Assessments and Consent Orders and Agreements. Bob also assists clients in complying with environmental reporting obligations such as Toxic Release Inventory (TRI) Reports, Tier II Reports, Annual Emission Statements (AIMS Reports), Hazardous Waste and Residual Waste Biennial Reports, and Monthly Discharge Monitoring Reports. Bob graduated with Honors from Carnegie Mellon University in 1990 with a Bachelor of Science Degree in Civil Engineering and Engineering and Public Policy. He received his Master of Science Degree in Environmental Engineering from the University of North Carolina in 1992. Following graduation, Bob was employed for three years as an environmental engineer in the Superfund Section of the North Carolina Department of Environment, Health, and Natural Resources in Raleigh, North Carolina. In 1998 he received his Juris Doctor Degree from the University of North Carolina School of Law where he was a member of the Environmental Negotiation Team. Bob's technical background coupled with prior governmental agency experience gives him a unique perspective when interacting with environmental consultants and counseling clients on complex environmental matters. He has assisted several clients in responding to comprehensive USEPA sector-based investigations and Section 112 information requests. Bob works closely with clients and engineering consultants during facility expansions and other large projects to ensure that regulatory implications are properly addressed without adversely impacting construction schedules.